The Spectre Cycle by Alan Burt Akers, the final The Saga of Dray Prescot omnibus is now available from good ebook stores everywhere, including Amazon (for Kindle), iBooks, Smashwords, Google Play Books, Kobo, and Barnes & Noble (for Nook Books). 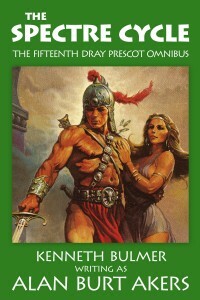 The Dray Prescot Saga, omnibus edition, containing books 50 to 52 in the epic series. Dray Prescot has been chosen by the Star Lords to be the so-called Emperor of All Paz. Together, the countries of Paz must resist the deadly Shanks who raid from over the curve of the world. Delia and Dray Prescot have abdicated the throne of Vallia and now seek to make the dream of a united Paz come true. Whether Prescot is battling slavers and freeing slaves with the Kroveres of Iztar, or fighting Fish-heads in the land of the Shanks, he is certain to be thrown into more headlong adventures under the streaming mingled lights of the Suns of Scorpio. The undead monster called the Spectre has been destroyed. Didi herself lies seriously injured in Zandikar in the Eye of the World, lovingly tended by her cousin, Princess Velia. Ulana Farlan, the governor of Didi’s province of Urn Vennar, has been removed from office. Now the rogue and schemer Nath Swantram, Nath the Clis, rules. But the Spectre, dead and animate, is about to terrorize Gafarden again as Tralgan Vorner, the wronged Elten of Culvensax, seeks vengeance on those who betrayed him. Within Vorner the Spectre lives. Including a glossary to the Spectre cycle. For more info, please see the The Spectre Cycle page on mushroom-ebooks.com.